So I’ve decided to be brave and just put it out there. Here is my first piece of creative writing as part of my course. I’d love to know what you think. And please, be critical! It’s okay, it’s what I need. What works for you? What doesn’t? Any changes you would make? I promise I won’t be offended. Just ‘be more constructive with your feedback, please’. Anyone know what that line is from? I like you if you do. I have had my official feedback and grade for this piece, but any feedback you have is really useful. This piece is autobiographical, but rather fabricated in places. Let’s just say I discovered boys and alcohol. You’ll know which part I’m referring to when you get there. 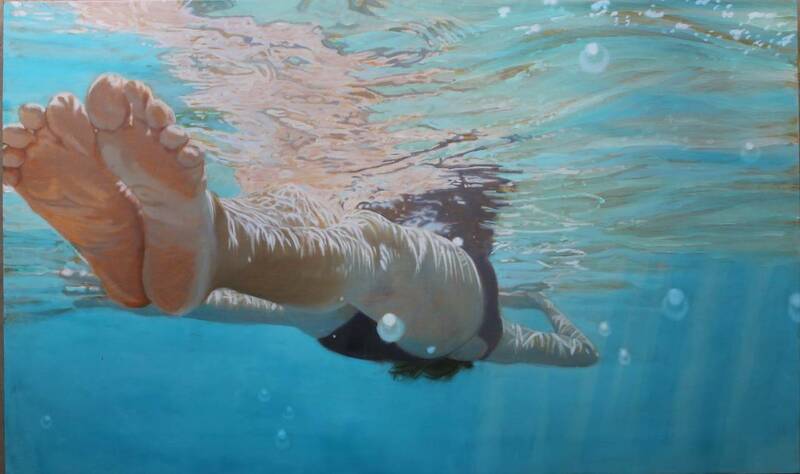 As I stand on the block, peering down into the aquamarine tinted water, the involuntary shake in my right leg begins. My decline into a quivering mess is quick and predictable. The degeneration usually begins with the consumption of too much raw jelly. Ironically those sweet, squidgy, energising squares of sugar were firmer than my stance on the starting block. For a competitive swimmer I did not deal well with competition. Whilst those around me channeled their inner Pickering and Sexton, stripping themselves of club kit and splashing themselves and all those within 10 feet of them with pool water. You would find me, already in my costume, sitting quietly on my block, trying to slow down my racing heart, to relax my scrunched up stomach and quadruply check that my goggles were firmly sucked on to my eye sockets. The starting block felt like the loneliest place in the world. The pool building, which seconds before that first whistle had blown, lent itself perfectly to amplifying the humdrum of the spectators, now simply amplified the silence. All eyes on you. Take your marks. Bleep. I didn’t care about winning. I could shrug off a DQ. I could even force a smile if a false start meant I didn’t get to compete. What I couldn’t deal with was the thought of letting everyone down. All those hours my coach had invested in me. All those trips to the local pool, where the danger of ingesting a submerged plaster was rife and a ‘poo evacuation’ thanks to the Splash Babies session before ours, not uncommon. That slight chemical fragrance that forever clung to me would be for nothing, if I didn’t put my all into that one minute of racing. But when I entered that pool, all that pre-race tension, the nausea and the dread was gone. It was just me and the water. The muffled roar of the crowd, my rivals in my peripheral vision, but essentially just me. This was the part of swimming that I loved. The quiet, the speed, the signs of exertion that I felt, but knew were masked by my effortless stroke. Because I was good, I was really good. I just didn’t care. At the grand old age of 18, I retired from competitive swimming. Those nerves I felt on the starting block had started to creep into my everyday. That knot in the pit of my stomach had started tying before training, as I fell asleep at night and as soon as I awoke in the morning. I was drowning in the pressure. Yet I find myself peering into the depths once more. Except this time when that first whistle blows, I lower myself into the water and feel the squelch of mud between my toes. 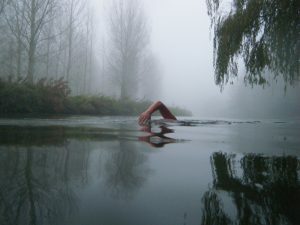 I jostle for space and other than the cold, murky water trickling through my wetsuit, I feel relaxed. This time, the crowd isn’t watching my every move, anticipating that gold medal around my neck. I’m part of the crowd from now on, because this is triathlon, and like a fish out of water, I’m not designed to run or ride a bike. Once the air horn sounds and my feet lift from the lakebed it takes just a few minutes until I’m completely alone save a duck or two. The occasional string like reed runs through my fingers and sometimes the murk will clear, offering a glimpse of lake dwelling creatures. My one minute sprints are a thing of the past, I am now at one with the water for nearing half an hour. That’s a long time to spend with your own thoughts. No interruptions. No real distractions. Yet the loneliness of a triathlon is one I embrace. The only pressure I feel is from myself, to do my best, to earn that slice of cake at the finish line. Competing in a world with no expectations is liberating and motivating in equal measure. Dragging myself out of bed at 5.30 am, wrestling my bike into the back of my car, ignorant to the warrior paint grease smear across my face, it’s all okay, because there’s no pressure on me to win. It’s often said that ‘winning isn’t everything,’ but when winning isn’t remotely anything, you’re free. Because even the best swimmers can drown you know.